← Who’s Got the Copyright? 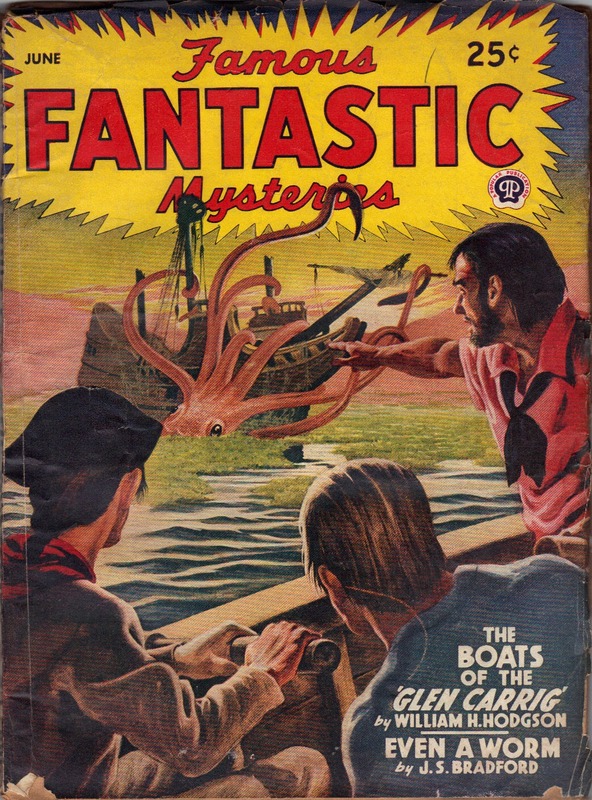 Today I’m presenting the cover from FAMOUS FANTASTIC MYSTERIES from June, 1945. This particular issue is important for several reasons. First, it was Hodgson’s first cover appearance on an American pulp magazine. The early publication (in 1944) of THE GHOST PIRATES in the same magazine did not earn WHH the prized cover spot nor did the reprint of “The Derelict” in the December, 1943 issue. Second, this was the third appearance of an WHH work since the 1920-21 Holden & Hardingham editions. Third, this was once again the result of the efforts of H. C. Koenig who convinced FFM’s editor, Mary Gnaedinger, to publish WHH’s fiction. Forth, the ‘renaissance’ of Hodgson could have stopped right here as this reprint of BOATS OF THE ‘GLEN CARRIG’ was drastically edited. Readers who had thrilled to the reprint of THE GHOST PIRATES now denounced this ‘new’ work and questioned if it was truly the same author. Thankfully, August Derleth, encouraged by Koenig, saw the potential and produced the omnibus THE HOUSE ON THE BORDERLAND AND OTHER NOVELS through Arkham House in 1946. This was, however, the last appearance of Hodgson in FFM and it is not known if this was because Mary Gnaedinger no longer wanted Hodgson material or if Derleth wanted it all himself. This cover, and interior illustrations, was by FFM regular Lawrence Stevens. To my eye, it is a fine cover for the novel and, had I been alive to see it on the stands in 1945, would have snapped it up in a second! Some sites usually do not allow the writers to have capitalized words or several links within the body of the articles so that’s something you’d have to prevent. Alternately, a comic character can placed into the normal world.